I’m trying to remember the exact words and I almost have them but not quite. A friend was saying something about the London Marathon about either starting slowly or not going fast. Slower than even the half-marathon pace. It’s a sentiment echoed by the New York Times as well in the article The Best Marathon Advice You’ll Ever Get written by Liz Robbins: “Don’t go out too fast. You will be tempted. Resist. Don’t do it.” There’s a lot of advice out there but this one seems worthwhile and consistent. There was just over one month of training left last week when I was chatting about the marathon and I hadn’t run more than a half-marathon distance yet. By the end of the chat I had approached a little closer to panic with his earnest admonition to run at least 20 miles before the race. If I was increasing my speed at no more than 10% a week that would give me only around 15miles -> 17 miles -> 20 miles by the third week and then tapering off before the marathon. That weekend (this last one) would be crucial. I woke up in a panic that Saturday at around 3.30 in the morning with thoughts of all the miles I hadn’t run yet. I spent the rest of my night exploring what resources were available out in the wider social networked world and I came across a video blog and twitter account of @runitfaster. I felt a little better and paid attention to some great suggestions from a sporting coach on threshold runs, longer runs, and tapering. I’ll outline some of the suggestions because the video was only up for a couple of days. I recommend following him on Twitter if you can for further advice. Remember the purpose of tapering which is to allow your body to recover. If you’re looking for a 4 and a half to 5 hour time, then aim for 25-30 mins recovery runs. Mentally preparing: this is such a big deal, especially if it’s your first one, pacing the race can be tricky. For a sub-4 hour run, your average pace should be around 9 minutes per mile. There are three strategies for running the race: 1) either a steady pace throughout; 2) run a positive split, first half faster than the second half; 3) negative split, run the second half faster than the first half, step it up 15-20 seconds faster each mile in the second half. You need to prepare the strategy mentally first, go into the race with a plan. Breaking the race into sections is another strategy. You can see the marathon, as two 10 mile races and then a 10km, and the real challenge is the 10km at the end. For a marathon runner the 10km is an easy run, easy peasy. Of course it doesn’t matter how you break it down, either 5km or 10km as well. Find out where the water or fuel stations are. 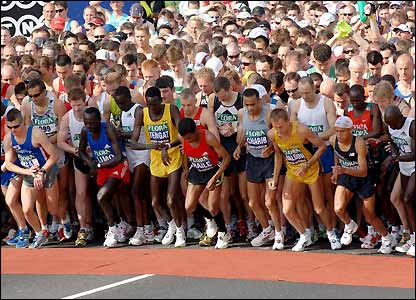 With the London Marathon you can find it on the race web site or in the magazine Marathon News. This gives you something to aim for. Plan your race day routine as well. Hour by hour. What time do you have to get up in the morning, what time at the venue, start line. What you are going to wear. Avoid stress: get to a race early, and also have a warm up. Sudden changes in your program are something to avoid – increasing your sessions towards the end is a bad idea. Avoid excessive alcohol consumption as this will affect your training, performance and recovery. Try to get early nights, allowing yourself to recover. An extra half an hour / hour in bed will make the world of difference. They end with the same advice with which I, and they and he, start: don’t go out too fast. I’ve made a note. This entry was posted in Running and tagged Liz Robbins, London Marathon, NYT, runitfaster, Running, speed, tapering. Bookmark the permalink.